And Democrats already smell opportunity, confident that Trump’s presence on the ballot turns safe red seats into winnable battlegrounds. But the loss of a single presidential election could pale in comparison to the long-term damage done to a party that already has a strained relationship with this fast-growing voter bloc. “Republicans have been tarnishing their brand with Latino voters for some time," said C larissa Martínez-De-Castro, a senior official with National Council of La Raza, a Latino advocacy group. "I n some ways, Mr. Trump is putting that on steroids." There’s already evidence to suggest Trump is motivating more Latinos to register to vote. Voter rights organizations already have seen more Latinos register at this point in the year than they have in years past. Part of that boom likely reflects a population increase. But some of it is specific to this election. "It&apos;s clear that there is something different going on," said VL Action Network President and CEO Maria Teresa Kumar. "There&apos;s just a sense of urgency among the community," she said. "It feels like open season on us." VL Action Network is a 501(c)4 organization, which means it&apos;s nonpartisan. But it did denounce Trump last week after he became the presumptive nominee. “American Latinos have been listening closely to the new Republican nominee Donald Trump and his hateful rhetoric against immigrants, Latinos, Muslims, and women. And we’re preparing for November," the organization said in a statement. Between January and May 2012, Voto Latino recorded about 400 new registered Latino voters nationwide. That number increased almost tenfold between January and May of this year. And the year is still young. VL Action Network doesn&apos;t typically start its official voting registration efforts until mid-summer. The GOP’s popularity deficit with Latinos didn’t begin with Trump. John McCain won just 31 percent of the Latino vote during his 2008 presidential campaign, according to exit polls. Four years later, Mitt Romney performed even worse, winning just 27 percent despite doing better overall with voters than McCain. The GOP vowed to do better with Hispanics after Romney’s defeat, encouraging the party in its much-ballyhooed post-election report to support immigration reform that included a pathway to citizenship. “It does not matter what we say about education, jobs or the economy; if Hispanics think we do not want them here, they will close their ears to our policies,” the report read. But immigration reform legislation failed under pressure from conservatives, and many in the party later vowed to repeal President Barack Obama’s executive actions to defer deportations for the children of illegal immigrants. The differences extend beyond immigration, too. Polls find that the Hispanic community favorably views government intervention, said Mark Hugo Lopez, director of Hispanic research at the Pew Research Center. And that lends greater-than-average support for programs like Obamacare or raising the minimum wage, he said. “The Democratic Party is also a party that, on many policy issues, is more closely aligned with views of Hispanics than the Republican Party,” Lopez said. Trump has six months to improve his image with Latino voters. A new focus on broadening his appeal to a general election audience — rather than winning over just Republicans — could conceivably encourage him to change his tone toward those voters. Surveys suggest he has a lot of work to do. A February poll from The Washington Post /Univision found eight in 10 Latinos held an unfavorable view of the billionaire. A Gallup poll in March reported 77 percent of Hispanics don’t view him favorably. For now, Trump is on track to not only perform worse than Romney, but worse than any GOP presidential nominee since exit poll data was available on the subject in 1980. Former GOP presidential nominee Bob Dole held the previous record, winning just 21 percent of Hispanics in his 1996 campaign for president. “There’s potential for growth, if any polling done by others is any indication,” Lopez said. “It looks like that number could grow into the 80 percent range in 2016.” The fallout from that could cause the GOP’s nominee immediate problems in Arizona, a state that has gone red in each of the past four presidential races but one where a burgeoning Latino population has made it a long-term target for Democrats. Trump could accelerate their timetable. The Republicans still have many advantages there, Frey said. That includes a strongly conservative voter bloc and an election participation rate that lags behind other demographic groups. But a motivated Democratic Party has more room to grow, he said, because so relatively few Latinos normally vote. As of 2014, the state’s population was 31 percent Latino but only 21 percent of them were eligible voters — suggesting that efforts to register more Latinos could be successful. It&apos;s not a foregone conclusion that Trump’s damage to the GOP will be long-term, some Republicans say. "It&apos;s hurtful for this election," said Alfonso Aguilar, president of Latino Partnership for Conservative Principles, an advocacy group based in Washington that works to engage Latinos on conservative issues. The group denounced Trump last October and plans to help turn out Latino voters in down-ballot races later this year while telling them to leave the presidential line on their ballots blank. Many Latinos, he argued, still identify as independents, which gives Republicans an opportunity to win them back in the next general election. 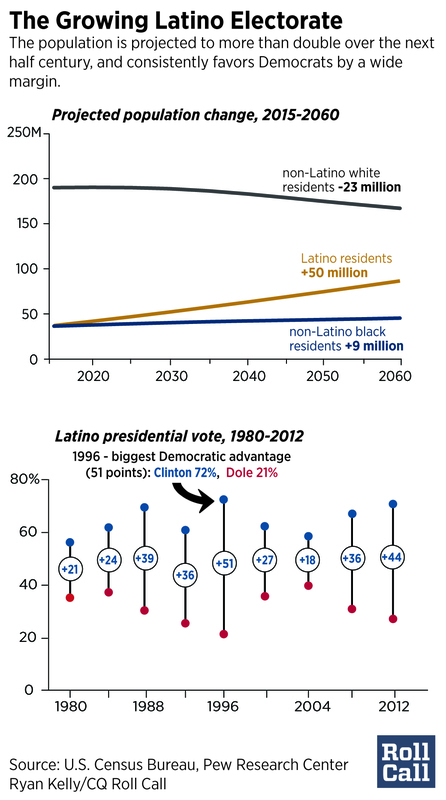 "You don&apos;t lose Latinos for generations to come," he said. "Latinos are not a monolithic group," he said., Shifting demographics will also work in Republicans&apos; favor, Aguilar said. Many white working class voters believe that immigrants are taking their jobs, Aguilar said. But as their percentage in the Republican Party diminishes, he said, Latinos who embrace conservative values will have a greater voice in the GOP. "It could very quickly change in four years," he said. "I see Trump more as a parenthetical in the political evolution of the Republican Party." Democrats have made missteps with Latinos, too, Aguilar said. He pointed to a December post on Hillary Clinton&apos;s website called "7 things Hillary Clinton has in common with your abuela," which provoked a backlash in the Hispanic community. "Mexicans don&apos;t eat taco bowls; that&apos;s an American creation," Aguilar said about the tweet in which Trump said he loves Hispanics. But Clinton saying "everyone loves abuela," Aguilar said, "is just as bad." Contact Roarty at alexroarty@cqrollcall.com and follow him on Twitter @Alex_Roarty Get breaking news alerts and more from Roll Call on your iPhone or your Android.